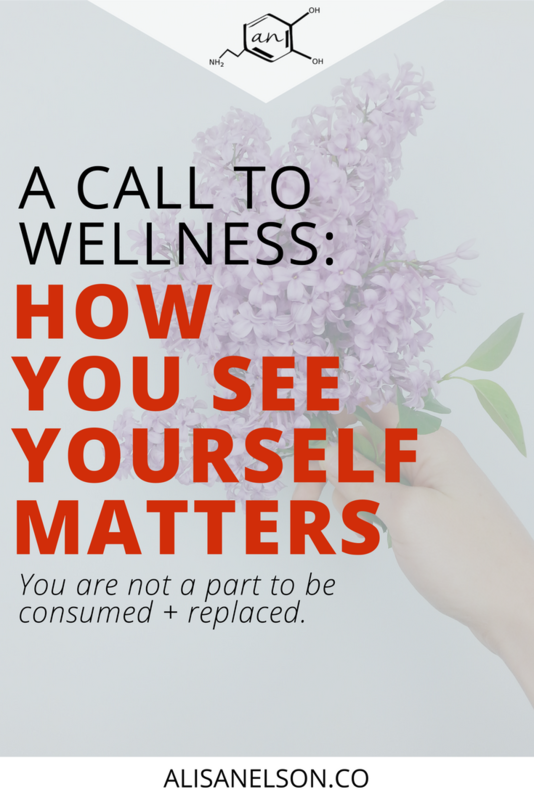 What would it look like for you to value your wellness at the same level you value the people you work with? What if we challenged our typical view of always-trying-harder until we simply burn up? We each contain within us a beautiful system of biological processes that enable us to do things like regenerate cells, find solutions to never-before-answered problems, and connect across space with other human beings. True wellness is the pursuit of living in this fully human experience. The better we get at understanding + supporting our own biology, the more we will be able to step up, engage, and connect with the world around us and our place in it. We keep trying to treat ourselves like we are machines when in fact we are organisms. We, as organisms, move circularly rather than linearly. We hum along in a rhythmic pattern instead of a droll assembly line. This is why we see so much of ourselves and our lives in the natural world around us – because they too live in rhythm. As I dig in the dirt planting bulbs in the cool October soil I’m drawn to thoughts of how temperature signals my own biological systems to change up the priority scheme. Did you know that the fall is the best time to plant shrubs? It’s the time of year when they will push their roots deep into the earth and focus their efforts on a sturdy foundation, while in the spring and summer they are more focused on reproduction. Whether we are hardwired to think in terms of seasons or if it’s more an long-standing + ingrained cultural norm, I’m not sure yet, but the older I get the more frequently the women around me talk about seasons. Harkening our minds back to the wise King who tells us there is a season for everything (or perhaps a rebellious Kevin Bacon is more your style?). When I’m digging in the dirt or watching my children eagerly wait for the falling leaves, I’m soothed by this reality of seasons. Like the turning tide, it comes because we need it to. Because there are different processes that need to take place for fullness of life. As sleep is necessary on a daily basis for the regeneration + cleansing of our cells so we move through important human moments on a larger time scale. But when I’m talking to fellow moms or women immersed in their own versions of “busy season” it sounds (+feels) more like a prison than the melodic orchestration of a Creator. Like Calvin, who yells at the sky demanding for snow to fall, we ache for the next season to get here. Like now. Right now. Or we resign ourselves to the lie that this is going to be the rest of our lives. I can’t tell you how many times I’ve had to manifest out loud to my husband that I’m anxious my son is going to be 2 for the rest of his life. As silly as it sounds (especially to the non-moms out there), some days just get us to the point where we think we might actually have to tear out of our skin if we have to live one more day in this season. One more day of anxiety. One more day of too-loud children. One more day of all our efforts making zero difference. One more day of no time for ourselves. So we pat ourselves on the back and try to see a silver lining – “It’s a season!” An exhausting season. How do we get to the point where we can sense the melody? How do we return to ourselves as organisms with bodies flowing + grooving to the beat? I think it’s circular. When we see ourselves as organisms, we feel like it too. We hear the music. A machine can go for a time without a repair. Once it’s built it can thrum along doing its job – giving its attention to others. No need to pay attention to self until its parts are consumed. Then replace them and keep truckin’. It doesn’t matter to a machine if it is day or night, or whether it is running a single cycle or a hundred. It runs the same. But we are not machines. And it is a mistake to believe that we can go seasons without regular maintenance. We can’t just plug ourselves into the wall and go, go, go. We have to circle back to restore our cells and our hearts daily – even more than just during our sleep! We are more like a tree than a car. A tree can produce fruit because it receives from the roots and leaves at varying degrees throughout its life cycle. It does not stop taking in carbon dioxide or water while it pushes out flowers. This is actually when it is the neediest. We are designed to regenerate on a daily, monthly, and yearly basis. You cannot expect to continue on successfully throughout your career operating as a machine. In your neediest seasons – the ones when you’re swamped with projects or your kids are struggling or your team is trying to overcome an unforeseen obstacle – these are the times when you have to double check your soil is good and get that extra bit of water. But more often we feel the drought and decide it must be that we’re meant to go the long haul on our own. We let our external cues dictate our rhythms instead of the God-given internal cadence. You are not a part to be consumed and replaced. Your work environment might lead you to believe you are. Your work load might lead you to believe you have to. But that is not the melody you were made for. The path to wellness looks different in different seasons. We wouldn’t call a leafless tree in January “dead.” But does your fall + winter lead to pushing up new shoots in May and a bountiful harvest in August? Or does it leave you clawing for oxygen and ready to sleep when your leaves should be breaking free? Can you rejoice during the holiday season or is it spent in recovery + anxiety? Around here we won’t pretend that everyone’s wellness should look the same. But we will talk about wellness and performance as if you’re an organism that lives in a particular kind of rhythm. And I think you’ll find that when we talk as humans, you’ll start to see + feel the beautiful melody that envelops you inside and out. And you’ll want to dance to the beat. This is beautiful. I always love the rich wisdom with which you write. your words always mean so much to me. love you, friend.